A tea banquet ceremony called Bai Cha (摆茶 ‘tea spread’) has been practised for thousands of years by the female peasants of Wu Tun (吴屯) where fresh tea leaves are pan-fried and brewed. To celebrate International Women’s Day on March 8 I’ve decided to dedicate this blog post to a few of the numerous Chinese rituals and customs that revolve around women and tea. Traditionally, tea plays an important role for a woman at every stage of her life. Unmarried girls must always be ready with good quality teas and cakes to serve to any suitors who may call by. Young women engaged to be married get taken out by their friends and family to a celebratory tea. On the third day after a wedding, the bride’s parents visit the groom’s parents (where the newly married couple will by now be living) bearing gifts of tea leaves, dried green beans and orange peel with sesame seeds. Only after this do the groom’s parents pay the bride’s parents a visit, whereupon the newly united families enjoy a ‘bridal tea’ together. In every traditional family, during the 15-day spring festival celebrations, the ‘lady of the house’ by custom offers a bowl of sweet tea to her husband and to the family ‘elders’, followed by a bowl of salty tea with pickled carrots and green peas. 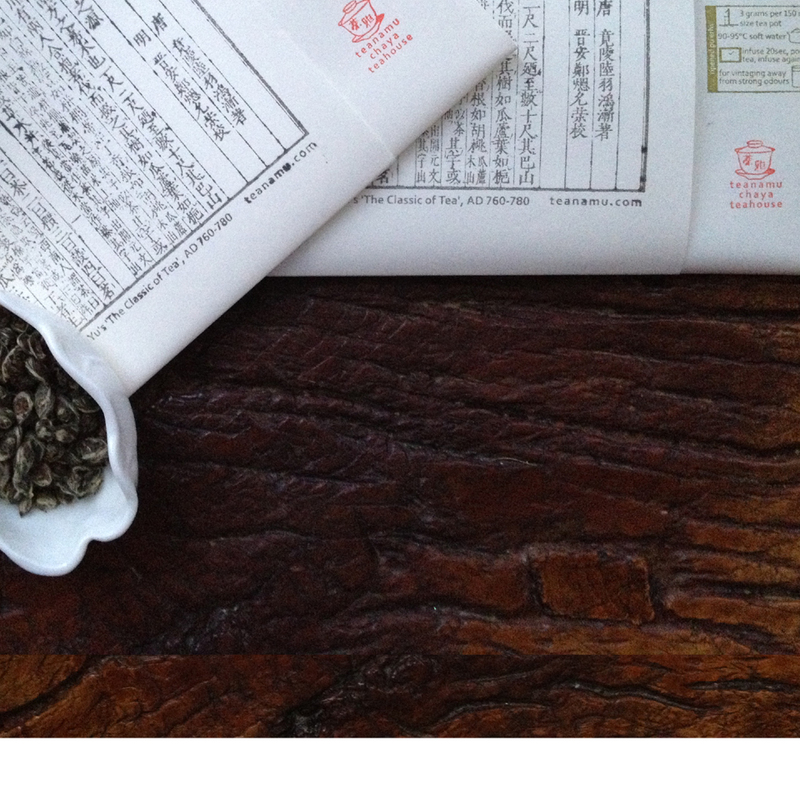 As soon as both teas have been consumed, she will serve a bowl of delicate green tea to usher in the new year. 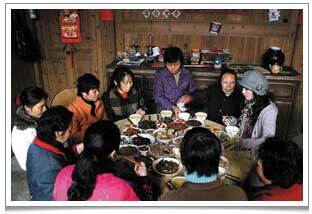 A tea banquet ceremony called Bai Cha (摆茶 ‘tea spread’) has been practised for thousands of years by the female peasants of Wu Tun (吴屯), a village in the Wuyi Mountain area of northeastern Fujian province. It is typically organised by the one of the eldest women in the village. It is not a particularly sophisticated affair with gaiwans and purple clay teapots. The women – menfolk are not allowed! – use rice bowls instead of tea cups, and rather than brew the famous, local oolong teas like the highly oxidised Wuyi Shuixian and Tie Luo Han (which I guess are reserved for selling on to the market) they infuse green tea leaves which they have pan-fried on the spot. These leaves are called ‘Cha Niang’ (茶娘 ‘tea mother’). The Bai Cha tea ceremony starts with each rice bowl about two-thirds full of water and then some ‘Cha Niang’ green tea leaves are added and the beverage served up. In particularly prosperous times the women make a great feast to enjoy with the tea but, if the harvest is bad, they search out wild vegetables, seeds, nuts and fruits together with bits of tofu and dried bamboo shoots, and make them into dishes to accompany the teas. With great tea aromas and their delicious, home made snacks, the women enjoy a well-deserved respite from their labours and any grudges or grievances they may feel toward each other simply dissipate. No one knows for sure how the tea banquet ceremony got started but presumably, while the men tilled the fields, their wives would visit each other’s homes with tea and titbits to chitchat and exchange gossip and advice once their daily work was done. Over time, these visits became formalised. I would love to host a tea banquet ceremony at Chaya Teahouse some day although, since I am not a woman, I will keep my presence suitably discreet! PS: This week, we are celebrating the International Women’s Day at the Chaya Teahouse with our special Rose Menu: White Tea and Rose Madeleines, Roselle Tea Jelly with Osmanthus Honey and Warm Scone with Rose Petal Jam and Clotted Cream.